Eighth Grade, Bike Crashes, and Vegan Care Packages - Oh My! It has been a good long while since I posted last. This is not new. What is new? The boy is well into his eighth grade school year. The most exciting thing for me has been watching him progress in cross country. He stuck it out all three years, and this year the boy's team earned a spot at State! (Two of our awesome girls earned a spot at State as well!) Tomorrow is the state meet. It makes the end of middle school and approach of high school that much more real with the end of cross country season. What else is new? Monday I took the day off from work since school was out. I had purchased some panniers for an upcoming trip (back to Ireland!!!). I rode my bike to the bike shop to purchase a rack once I determined my old rack wouldn't fit my newer bike. Having installed the rack, I really wanted to test out the panniers. So, against the teenager's wishes, we started cycling to the library (versus driving). Unfortunately for me, the railroad crossing about two miles from home decided I didn't need to stay on my bike, and I took the first flying leap off a bike I can recall taking pretty much ever. The fortunate perspective of the crash is that I was on the shoulder, not in traffic, and I was able to ride my bike back home to then drive a relatively short distance for medical assistance. My right knee and elbow/forearm looked pretty, let me tell you, but I didn't break anything or need stitches. So, the lesson is, don't take vacation days. Just go to work. In the BEST new news, I participated in the Third Annual CVL Care Package Swap this year! 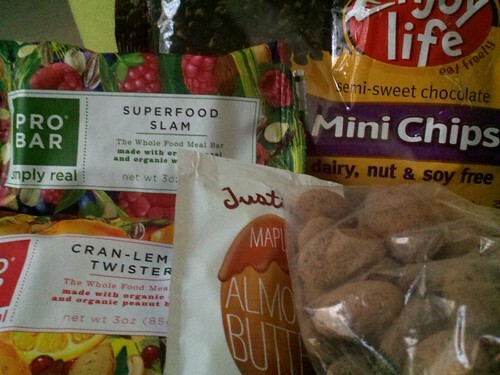 It was my first time participating in the swap, and I was very excited to exchange veg*n goodies with another blogger. I was paired up with Meggie of The Vegan Adventures of Meggie and Ben. I think we were very well matched since neither of us had much in the way of restrictions for the other person, but then again when everything is an option, it's hard to narrow down your final selection. 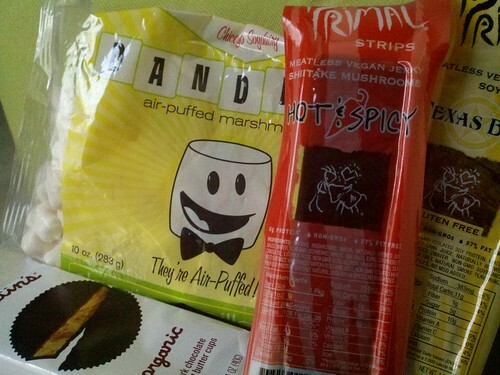 There are a LOT of vegan goodies in the world! Meggie's package arrived Wednesday this week, and I wanted badly to tear through it to see what was inside, but I demonstrated amazing restraint by waiting two more days so I could investigate and blog at the same time. Meggie wins for care packages because she managed to achieve a balance of items new to me, items I have been wanting to try, and items I already love. 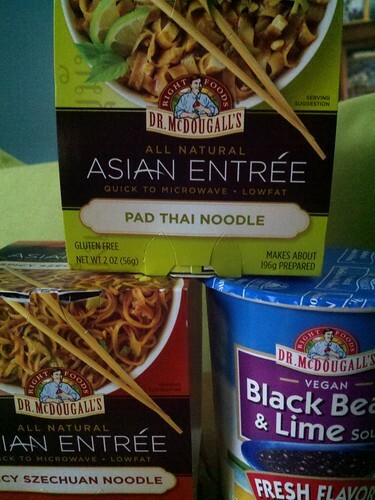 Falling under the new to me category: Dr. McDougall's entrées and soup. I rarely pick up convenience meals like this for myself, so these will be a treat on those days I just can't get away from my desk for lunch. 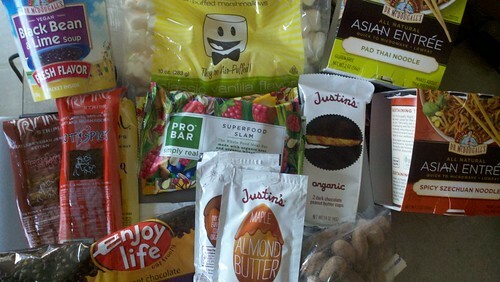 Also falling under the items I have wanted to try category: Pro Bars, Justin's nut butters, Enjoy Life mini chips, and what appear to be almonds in a dusting of cocoa powder. I think it's fair to say I will always want to try mini chocolate chips and almonds even if I didn't realize it until they show up on my doorstep. More delicious snacks await me. Last, but not least, falling under the I love these category: Dandies, Primal Strips, and Justin's Dark Chocolate peanut butter cups. You just can't go wrong here. If you aren't familiar with Dandies yet, you need to get familiar with them, and if you haven't tried Primal Strips for some unknown logic, try them. They pack a nice amount of protein into what I consider a low-calorie, non-stomach busting snack. These are all good. Oh, yes. Thanks, Meggie, and I hope you enjoy the contents of your package!